Our “Plastic to Oil Fantastic” video brief about the invention of a plastic-to-oil converting machine went viral and exceeded 3.7 million views on YouTube. This is evidence that concern over “the plastic problem” is certainly not going away, despite encouraging bans on and decreases in the use of plastic shopping bags. Here on Our World, on the video’s YouTube page and those of re-posters too, as well as on the hot Reddit Science link, the topic has generated much interest and debate amongst commenters. Many think that this type of recycling is not a solution, but that instead the world should be seriously focused on the first “R” — which is reduce. We should shun single-use plastic (such as your average PET bottle or disposable container) altogether, they argue. The world’s oil resources are diminishing; does technology like this enable our denial of that fact, or is it a hopeful and constructive step in the right direction? Others are doubtful of the conversion process and have concerns about pollution or toxic residue. But the machine actually uses highly efficient but pretty straightforward pyrolysis: the plastic is fed into the pressurized oxygen-free oven and heated to 427° C (800°F), which liquefies it. The machine then converts the liquefied plastic to gas, which condenses to form a crude oil mixture of gasoline, diesel, kerosene and heavy oil. Blest tells us that, if the proper materials are fed into the machine (i.e., polyethylene, polystyrene and polypropylene — PP, PE, PS plastics), there is no toxic substance produced and the small amount of inert char residue that may be leftover can be disposed of with regular garbage. They also explain that while methane, ethane, propane and butane gasses are released in the process, the machine is equipped with an off-gas filter that disintegrates these gases into water and carbon. Lastly, commentators from around the world are anxious to know if and where they can purchase a machine. Though the company still mainly produces larger, industrial-use machines, Blest Co. will be more than happy to hear from you. Please contact them directly at info@blest.co.jp. Below is the original article, published on April 14, 2009. We are all well aware of plastic’s “rap-sheet”. It has been found guilty on many counts, including the way its production and disposal raises resource issues and lets loose extremely negative environmental impacts. Typically made from petroleum, it is estimated that 7% of the world’s annual oil production is used to produce and manufacture plastic. That is more than the oil consumed by the entire African continent. Plastic’s carbon footprint includes landfilling and incineration, since sadly, its recycle rate is dismally low around the globe. Plastic trash is also polluting our oceans and washing up on beaches around the world. Tons of plastic from the US and Japan are floating in the Pacific Ocean, killing mammals and birds. Perhaps this tragedy is best captured in the TED presentation by Capt. Charles Moore of the Algalita Marine Research Foundation. Using less, or use it better? Thankfully, there are those who fully appreciate that plastic has a higher energy value than anything else commonly found in the waste stream. A Japanese company called Blest created a small, very safe and easy to use machine that can convert several types of plastic back into oil. 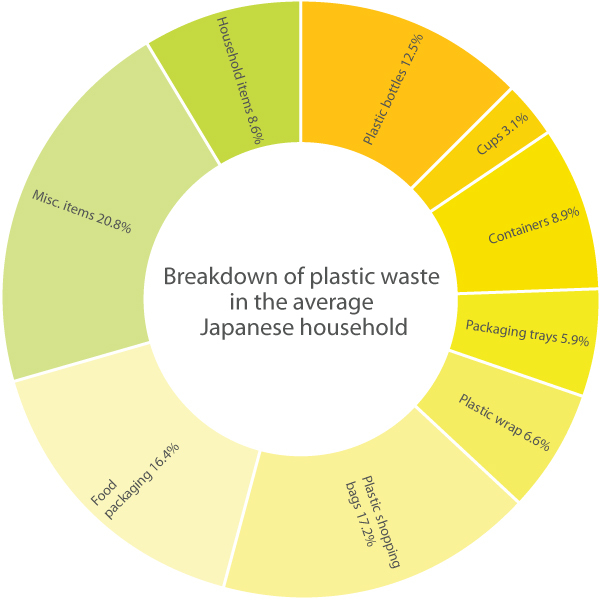 Though Japan has much improved its “effective utilization” rate over the years to 72% in 2006, that leaves 28% of plastic to be buried in landfills or burned. According to Plastic Waste Management Institute data, “effective utilization” includes not just the 20% that is actually recycled, but also 52% that is being incinerated for “energy recovery” purposes, i.e., generating heat or electric power. “If we burn the plastic, we generate toxins and a large amount of CO2. If we convert it into oil, we save CO2 and at the same time increase people’s awareness about the value of plastic garbage,” says Akinori Ito, CEO of Blest. Blest’s conversion technology is very safe because it uses a temperature controlling electric heater rather than flame. The machines are able to process polyethylene, polystyrene and polypropylene but not PET bottles. The result is a crude gas that can fuel things like generators or stoves and, when refined, can even be pumped into a car, a boat or motorbike. One kilogram of plastic produces almost one liter of oil. To convert that amount takes about 1 kwh of electricity, which is approximately ¥20 or 20 cents’ worth. The company makes the machines in various sizes and has 60 in place at farms, fisheries and small factories in Japan and several abroad. Sources: Kohei Watanabe, “Waste and Sustainable Consumption” March 2005; Association of Regional Planners and Architects, Detailed Sorting and Measuring of Household Waste, Kyoto 1998. Perhaps that statement is not as crazy as it sounds, since the makeup of Japanese household waste has been found to contain over 30% plastic, most of it from packaging. But it is the educational application of the small model of the machine that Ito is most passionate about. He’s taken it on planes on many occasions as part of a project that began some years ago in the Marshall Islands. There he worked with local government and schools to teach people about recycling culture and the value of discarded plastic, spreading the Japanese concept of mottainai, the idea that waste is sad and regrettable. In such remote places, the machine also serves as a practical solution to the plastic problem, much of it left behind by tourists: the oil produced is used for tour buses or boats, Ito says. “Teaching this at schools is the most important work that I do,” Ito reflects. In Japan too, he visits schools where he shows children, teachers and parents how to convert the packaging and drinking straws leftover from lunch. If we were to use only the world’s plastic waste rather than oil from oil fields, CO2 emissions could be slashed dramatically, he says. Akinori Ito demonstrates the machine to school children, teaching them about the energy embodied in the plastics we too easily throw away. The wonderful invention of plastics has spawned a huge problem that we are struggling to solve. With peak oil looming, things are set to change, but we find ourselves on top of an oil and plastic mountain, and the only way forward is down. So while many solutions like this are not without hiccups or detractors, they are a step forward in coming to terms with our oil and plastics dependence and help raise awareness of the carbon footprint of its production and use. Somehow we all know that plastics is a habit we need to kick. But that doesn’t seem to make it any easier. Perhaps the best thing you can do is to look more deeply into this issue. A good place to start is the 2008 Addicted to Plastic documentary from Cryptic Moth productions. You can watch the trailer online and maybe request it at your local video rental store. Next it is just a matter of taking action to break our love affair with plastic. Both the Plastic to Oil Fantastic article (by Carol Smith) and the video brief at top are licensed under a Creative Commons Attribution-NonCommercial-ShareAlike 4.0 Unported License. This work by United Nations University’s Our World Magazine is licensed under a Creative Commons Attribution-NonCommercial-ShareAlike 4.0 International License. I have to say that I agree with anonymous here. We need to know also what kind of energy is used up in creating the oil from the plastics too. What other by-products are produced? Frequently in “green media” we see a tendency toward adjectives when numbers are a more sober way of describing what the product really does. In the video we learn that this machine would “make [Japan’s] CO2 emissions much lower.” What does that mean? Are you calculating the energy of the machine only? Or the transportation cost of both the plastics AND the machine? What about the total amount of energy consumed in making the oil from the plastic VS the energy created? If it takes more energy to create the oil than we get out of that oil then wtf good is this machine? They don’t tell us that. I like that there’s money being put toward developing solutions, but we need to know (objectively and quantitatively) that the “solution” has taken all of these questions into consideration and that in the grand scheme of sustainability, it does more good than harm. The central problem appears to be two-fold. First, we discard vast amounts of plastic on a daily basis, and in places like Japan a lot of that plastic is incinerated. It can also be recycled (http://en.wikipedia.org/wiki/Recycling_in_Japan) which is a good thing (I hope you agree). Second, oil has to be transported from distant countries and requires a huge infrastructure that generates its own carbon footprint, so it could be argued that this footprint should be considered in some way. But we don’t. Do you think we should know these figures as well? Recycling plastics to oil in the view of Akinori Ito of Blest, is one way to respond to both of the above issues. He believes that the technology can be particularly effective in a small island or developing country context. From what I can see on the website, to turn 1kg of plastic into oil requires 650Wh of electricity. For 1kg of plastic, one liter of oil is produced. It is still early days for this kind of technology and you are correct to point out that we need to look carefully at such solutions within the grand scheme of sustainability. However, the same rigour needs to be applied to business as usual, but unfortunately it is not. That is why the story of plastics to oil is so interesting… it gets you thinking about how we use oil and plastics, about waste, and about being more efficient. I agree with your analysis (thanks also for the links to the info) and I absolutely think that we should consider the carbon footprint of the oil transport and business as usual methods of delivering goods such as plastic and oil. My main question for anyone considering this machine as a potential solution is, and I mean it constructively, is this machine the BEST way to deal with the plastic we currently waste? Would any of those plastic containers that we see being melted down be better served to be used again in their same form? Are their other means of recycling them (like into park benches or nylon fabric) and how much energy are these other methods going to cost? I highly recommend a book called “Without The Hot Air” by David MacKay http://www.withouthotair.com for a sense of the framework of empirical evidence that I’m trying to ask for here. As you said in your earlier comment the best action, broadly speaking, is to reduce our consumption. Perhaps that is outside the purview of the video, but that’s precisely the difficulty I have with “green media.” It tends to emphasize buying our way out of the environmental and energy problems we have instead of focusing on reducing our consumption. Understandably, most people don’t want to hear about using less and most funding for projects ultimately comes from corporations that need to sell new products. Yet as MacKay’s book suggests its much easier to take fewer flights and buy less “stuff” than it is to cover 10% of the Earth’s landmass with solar cells. Anyway, based on http://bioenergy.ornl.gov/papers/misc/energy_conv.html looking at the listing of petrol diesel we see 1 Barrel of Oil = 1700 kWh energy. Convert that to litres (159 litres per barrel) we find that one litre of diesel produces approximately 11 kWh = 11000 Wh which is GREATER than the 650 Wh of electricity that is needed for this Blest oil producing machine. So in the end, the benefit is a little more than 10000 Wh! This is good news and it’s precisely what I wish they had stated in the video. Of course we should mention that I’m assuming that the bioenergy website is correct and we’re not factoring any conversions (from electric energy to mechanical energy or chemical energy) into this back-of-the-napkin estimate. At least we know that the machine converts more energy from plastic than it uses. Is there anything else that works better? Jeff, your point about the net gain of 10KWh is great — it should have been the first question asked and addressed by the author of this article. Also, in the inventor’s interest of hyping the machine, there was no information about the price of the machine, waste byproducts, or limitations on the type of inputs. Can you toss in a chopped up bicylce tire, egg carton, and packaging peanuts in the same batch? 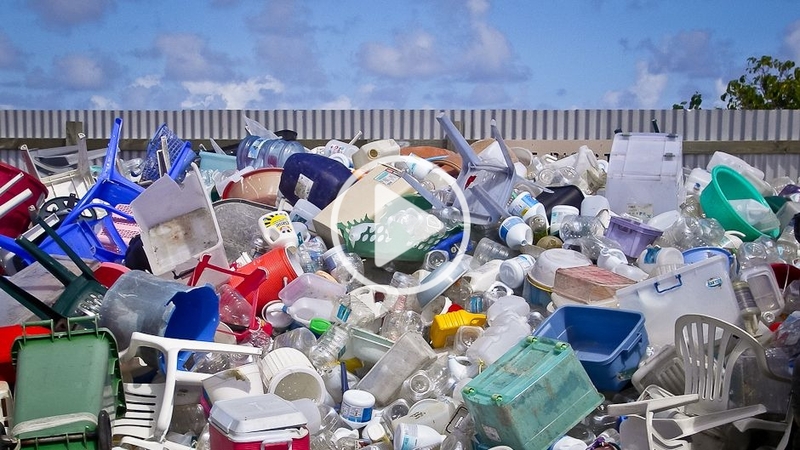 How resilient is the machine to a mix of plastic and other garbage? For example a kid’s toy that is 95% plastic and 5% metal and other chemicals? Or a happy meal container with a few french fries left in it? It’s a great topic and certainly any significant work done in this field, whether it’s revolutionary or not, is worth writing about, but only if the reporting takes scientific and critical look at the process. Hi Jason. We’re always open to constructive criticism but I’d just like to point out that you might want to read the article prior to critiquing it. We do indeed detail the types of plastics (and no, french fries from Happy Meals are not among them). Also, when it comes to the science details and net energy gains, while that is of interest to some, the majority seems to appreciate the focus of the story. That is that there are innovators, such as the inventor, working to wake us up to the fact that we are literally throwing away (or burning & polluting) valuable resources on a daily basis. Waking people up isn’t the problem. Enough people are as woken up as they need to be. What’s lacking are achievable solutions. There’s a new miracle green tech or promotion or practice every week, but without clear, hard-headed assessment of their merits all they do is contribute to people feeling hopeless when each, in it’s turn, fails to get traction. From practical as well as polemical perspectives, it worth seriously vetting what we get excited about. Thanks enteecee and I hate to seem consistently contrary but… perhaps you live in California or something because I beg to differ that enough people are awakened. That is certainly not the case in Spain, for one. Sure there are companies here making solar tech for example, but they survive mainly with exports. Your average Juanita/Juan still eats meat at least twice a day, loves to shop, drives her car daily, and contents himself with recycling bottles and plastic. Anyway, I was not suggesting that things like Blest’s machines were going to save the world or anything. That is going to take a much larger scale revolution that in my opinion is only just beginning and I believe is more along the lines of Dennis Meadows’ (http://ourworld.unu.edu/en/dennis-meadows-limiting-growth-to-save-the-world/) and Tim Jackson’s (http://ourworld.unu.edu/en/the-end-of-the-growth/) ideas than tiny solutions like plastic to oil. I live in California and have lived in several other states and traveled quite a lot, and I find consistently that yes, waking people up IS the problem. Not enough of us are awake and if enough of us were, we would not have the level of over-consumption or the massive flow of plastics into the ocean that we have today. Everywhere I go it is rare to find someone who gives a #$% about how their purchases are packaged, someone who brings their own reusable bags to the store, someone who even remotely thinks past the moment to the consequences. I know there are many of us out there, and even fewer who really walk that ‘talk’ but sadly the vast majority of people seem to be quite definitely asleep, here in 2011. I agree there are many new ‘miracles’ announced and even more greenwashing of old technology, and I agree that every worthwhile idea must be tested and questioned. This one does as well; yet this technology appears to be promising. Of course it must undergo rigorous testing and scientific analysis — hopefully it will come out on top. Recently I’ve noticed it is actually getting tested/used by Project Kaisai and Surfers w/o Borders, and I have hope that the more practical use it gets by concerned, intelligent, passionate individuals who care about getting the plastic out of the ocean (and stopping the flow into it), the more chance that any faults it has will come to light and hopefully be resolved. I’m not usually an optimist, but about this technology I am….much more so than about enough people ‘waking up’. This is sooooooooooooooooooooo true. I’ve been looking at P2O for three years and I STILL can’t figure out if these systems work or not, if air quality permitting is doable or not. And, talk about a feeling of helplessness/hopelessness……….I have $200,000 that I’d be willing to dump into a processor and make a go of it but again and again I find that these systems either run into the millions of dollars (very large facilities/processors) or they are the size of a tiny Blest. I see Blest appears to have some slightly larger processors now and I’ll be taking a closer look. Should anyone have a link or additional info on small-moderate sized processors, please list them in your replies. I see a poster by the name of “zardiw” posting about JBII.PK (stock symbol). Some say the company is a scam but they are allegedly attempting to get State of NY permitting to open a facility. Their systems are in the $200,000 price range, I believe. Wikipedia and the website of the company producing the making are not valid references. I was never asking a question, I was pointing out that the poster had no valid references. Posting a link to a google search is not a valid reference either. If you would like to know what I mean by a valid reference, take a look at any paper in a reputable scientific journal, for example: Nature http://www.nature.com/ , scroll down to the end of any paper and you will find a list of related scientific publications which back up the paper. I wish so much luck with this device. I really hope it works and we can deal with waste like that! Best of luck from Estonia! I have been working in Oil and Gas fields for over 20 years. I have worked in well over a dozen ‘developing’ countries. I do everything possible to encourage alternative solutions to energy problems because of what I see. You have to spend time in ‘developing’ countries to understand why the video is set in developing countries. Spend a week in Lagos, Nigeria. Plastic trash is everywhere. DItto in Angolo and South Africa. Not as bad but still present in Vietnam, Indonesia, and Malaysia. The key element to a machine like this is taking a waste stream and converting it into something that is usable. Which in someplace like West Africa could make a HUGE enviromental impact. The other key thing about this company is they are trying to educate about reducing waste. This is a mentality that doesnt exist in many parts of the world. As a fellow engineer, I understand what this company is trying to do. Those of you who are so skeptical, should study the basic chemistry involved (which is actually very sound and feasible), before you pass judgement about if it is too good to be true or not. Just like the founder of the company would want you to do, educate yourself. I agree James. Why wouldn’t we reuse what would normally be considered as trash to add to the landfill? This sounds like a great idea to me and one that would be great for an energy alternative. Very cool. I didnt even know that we had this technology. I hope to see more inpact of this invention in the future! I was fasinated by your article small plants Oil from Waste Plastic. I would like to examine economic viability of this process for a unit that can process 500 kg to one ton of waste per day. Can you help with full address of this Japanese co. Blest. Their website has matter in Japanese.Would you know about the use of catalysts in this. I believe this could be critical both cost wise and supply wise if one is a few thousand miles away from Japan. I too would like to contact Blest-I would like to try to bring a Blester to my university. Thanks Carol S (I actually had tried that link but I don’t read Japanese) Does someone have a link in English to the Blest Co.? I’m afraid that Blest does not seem to have an English site. You can try contacting them at the address given on their website (info@blest.co.jp) and perhaps include a google-translated summary of your inquiry, in case their English abilities are limited. Is anyone working with school or county waste management to set up such a demo? I am working on Renewable Energy at India. Currently am installing 7.5 MW Waste to Energy Plant and doing reclamation of Old Garbage Dump site (which is full of plastics). In a second phase we are planning to install Ewaste Plant. Since , we have a huge source of Waste Plastics we are willing to adopt a suitable process for converting these waste plastic to fuel. We would like to know more about the technologies and commercial aspects. If anyone having more information can share with us . Have finally received a reply from Blest by email from aoyama@blest.co.jp. whose written English is clear enough if a bit choppy. Glad to hear it CRM. Good luck to you. So maybe a ship could be fitted out to go to the Pacific Gyre and start converting “an area the size of Texas” back into ordinary sea before we all die from the dioxins in the fish. It could even be mostly powered by the plastic it is converting. Where is the might of the UN when it is really needed? How much cheaper it would be than ” peacekeeping”. But great idea about the boat with the plastics to oil machine. I think you will agree, however, that we are still going to need peacekeeping even if we can tackle the plastic in the Pacific Gyre somehow. Hi Brilen. Please contact the company directly at info@blest.co.jp. this is great!its going to change lives and help!machine is very pricey!but cheap for what it can do! How much and where do you buy this? Indeed there was a typo in the article, thanks for pointing that out. However, it was in the yen figure, not the US dollar equivalent. The price is 106 million yen, which is indeed around USD$12,700. Our apologies for the confusion. Just as with computers. When they first came out they were expensive, however with mass production the cost came down. The same will happen here. ok where do u buy? I would like to buy this product. What is the procedd to get a machine to my own?? How can I (if I can) buy a machine like that? Thank you! Digo, please contact the company directly at info@blest.co.jp. Thanks! The best solution to our current society of throwaway over consumption i to REFUSE single use and disposable plastic products, then there is no need for this machine, whether it works or not, creates new toxins or not, using tons of energy or not…..and where does that energy come from…in Japan? ….from burning Coal and from Nuclear energy. dangerous and wasteful. Hi Sachin. Please contact the company directly at info@blest.co.jp. Yes, the film is called “Who killed the electric car?” It is very good. The electric car was invented in like 1880 dude, in fact electric cars held the land speed records until the early 1920’s. Right up you street I think. Crikey – what a twit you are! I beg to differ. It was not invented by Ford. Nikola Tesla created and drove one in 1931. Robert Anderson of Scotland created one in early 1800’s. Ford did produce a number of them for testing and then would not renew the lease. I heard some people kept them anyway. It was GM,not Ford who made those very smart EV’s in the eighties!!! Not that it matters much,their were far biger issues raised in that doco.. The ELECTIC CAR was used in the 1920’s. They had one in the car museum at sparks NV. The electric car wasput out as the Baker Electric over a hubdred years ago. Baker Electric car company began in 1899 and operated until 1914. Edison invented the batteries that were used in the car, some of which still exist today. Jay Leno ownes one of the cars. Ford motor company may have improved on the idea, but they did not “Invent” it. Hate to tell you this, but the electric car only perpetuates fossil fuel use. It takes power(power plants(57% coal)) to recharge electric cars. Electric cars are a nice first attempt, but not an end solution. Research more in hydrogen, or better yet, compressed air vehicles. I am in the Environmental Science field. I’ve read that hydrogen powered vehicles, at least at this point, use oil to produce the power source to the point that it almost negates any benefits. But compressed air? I’ll have to look that up! Thanks for posting that. Electric cars were around in the late 19th century. In the early 20th century most cars were electric or steam powered. I think what you are referencing is General Motors (not Ford) introducing the EV1 back in 1990. Second of all, I have published an article on my website about this Technology. I have also linked to this site. Is that ok, Carol. I still can’t believe that world didn’t take notice of this invention. I will try my best to convey this message to everyone I know. Hello Jeevan. Yes, it’s fine that you post about it, thank you. We use Creative Commons licensing for the express purpose of sharing and encouraging innovation. Carol – any idea what the largest scale currently in use for this tech is? I noticed the mention of the factory in Ontario that puts out 20T a day. Is the idea to make several smaller stations within a larger urban core to shorten the transportation costs? How much easier their days would be if they no longer needed to spend hours separating different types of waste. They could use that time to be with their families, pursue more skilled work, get a higher education, etc. without having to worry about oil energy and haggling for pennies with various corporations who buy in bulk. The idea is all wrong, because you’ve got to make plastic to make oil, and vice versa, and the loop will never end with this kind of technology. Some people will get rich from this, but most people and animals will still die from this. Its not a question of making them, its a question of re-using. I’m so pleased you resurrected this video and article as I’d missed it the first time. It is inspired and inspiring to see Ito-san’s innovation and passion for education. Hey, just saw the video and asked myself after reading all those posts „Why is it, that the Blest Company doesn’t promote it’s great invention much more in the big way?“ It sounds, that the plastic-to-oil-conversion works. So what’s the problem with building bigger converters for industrial conversion? Is the amount of energy used for the conversion too big? Is there toxic waste left from converted material? Is it too hard to seperate the „good plastic“ (polyethylene, polystyrene, polypropylene) from the „bad plastic“ (PET, PVC and others)? Doesn’t it work in a big scale? To me it sounds like a fantastic invention and it seems that Blest discovered their own „oil-well“. But again, what is the problem to not only spread the word but flood the garbaged world with those cool machines? Over a year ago you posted this. When you got notification that someone replied to it you were thinking “what the heck? I don’t remember posting anything about that…” You click the link in the email and see the article and think “Oh yeah! I remember something about this!” The only exciting thing in the entire reply you went through the trouble of reading was “I do cocainnnnne kakakakakak yeahhhhh!” Since reading this article and giving it kudos, you’ve since moved on with your life, like everyone else who left their footprint here and completely forgotten this invention ever existed. You never took a single step closer to solving the very problem this inventor is struggling to solve. You may throw your plastic bottles in a recycling bin now and again, but other than that you are still just another person who claps their hands when they see something great, but is too lazy to do anything about it. Did you even print or at least contact your old cruise ship corporate office about possibly implementing using this machine? Nope, someone else probably will, right? Yeah, right, now go on with your day, maybe take the time to write a witty response. You’ll forget all about the world’s environmental problems in a few minutes anyways. At least a year ago you took 25 seconds to post a great idea on a website, no sense in taking it any further than that. Blest’s website claims the machine takes 11.627907 Kwattt of electricity at $0.10 per kwatt/hr (which it is) it would cost me $1.16 to make 1 liter of oil. Oil’s market value is $73/barrel or about $0.45 per liter. WOW I CAN MAKE $0.45 WORTH OF OIL BY SPENDING $1.16!!!!! WHERE CAN I BUY ONE OF THESE! I am glad to see this type of comment because it reminds me of the same narrow lens through which humanity has viewed finite resources i.e. only in terms of cost. We are all paying the price for this one-dimensional thinking. Consider how cost-ineffective it can be to recycle plastic, compared to dumping it into the ocean. Whether it comes to positive initiatives such food vans, recycling, sustainable fishing, organic farming, renewable energy or anything that actually maintains the systems we depend upon, there will continue to be price disadvantages while polluting behaviours are not penalised. While we wait around for governments to legislate in the long term interest, we can either choose to pay those ourselves by seeking cleaner options, or continue to deplete the resources. What we really need is a mindset change where communities decide themselves that the long term cost to the planet is more important than any pennies you might save today. Don’t you mean you pay $0.45 for your first liter and then you get another liter from the same resource for $1.16? Isn’t that good news, because that same resource is usually either dumped in a landfill or incinerated. Neither of these options are free of charge, and even have significant costs for society in terms of the CO2 emissions. Kevin, Where did your 11.62 KWhr figure come from? I searched the Blest website (the Google translation of it) and only found this link: http://blest.co.jp/s-5.html which seems to indicate the energy input was 0.650 KWh to process 1Kg plastic (which produces approximately 1 litre of oil, depending on the type of plastic). At $0.12/Kwh (the US national average for 2009 – http://michaelbluejay.com/electricity/cost.html) that’s 0.65 KWh * $0.12 / KWh = $0.065 of electricity input per litre of oil output. It looks like the average retail price of 1 litre of heating oil is ($2.25/gal * 0.26 litres / gallon) = $0.60 / litre. So it looks like the bottom line is that it costs 7 cents of electricity to produce $0.60 worth of oil. At today’s prices, it’s a bargain in more ways than one. $73 is for crude oil which is further refined. end cost is $3 a gallon to you. $0.45 is better than $3.00 plus less use of land fills another cost. plus environmental degradation. CRUDE oil is the market value you refer to at $0.45/liter, and today (2011/09/20)it’s much nearer $100/barrel than $73. You’re comparing apples and oranges. You must compare the price of Blest’s output oil to the price of REFINED oil like gasoline at >$0.80/liter, diesel (nearer $1.00/liter) and kerosene. It’s interesting how skeptical people are! Technorati asks “Is plastic to oil for real?” Well yes, indeed it is and Blest are not the only ones who have succeeded in designing technology to exploit our frighteningly short-sighted Plastic Habit. Here are examples of others who’ve invented similar machines: Check out this huge one that went in action a year ago at a Municipal Solid Waste Transfer Station in Maryland (USA) and this one, which includes a diagram of the process. When it comes to the cost/whether it’s “worth it”, etc., while I cannot speak for Blest (who are happy to hear and respond to anyone who has particular questions: info@blest.co.jp), other companies see the future utility of this sort of technology. One corporation, Green EnviroTech, recently announced its plans to “convert waste and scrap plastic into high-value energy products, including sweet crude oil”. So yes, please consider it confirmed: Plastic to oil is for real. Thankfully. Hey – look at this Carol – Fast Company just picked up on this conversion method and published a feature. They’ve got a BIG reader base. Thanks much for pointing out this article Andy, it is really good to hear that someone’s going to tackle the patch. Of course it would be great if they’d also spend some money to bring focus on the source… But yeah, Blest is just one of the companies out there that have seen plastic as golden. This was the first place i thought of when i saw this machine. My second thought was how much energy does it take to run this machine? Set it up so that remote places in India, Africa, and the middle of the Ocean can use wind or solar solutions. 1 kilowatt to make 1 kg into 1 litre of oil…yet again as per the article..!? Hate to be pedantic by ‘1 kilowatt’ is power, not energy… without telling us how much time it takes to make the 1 litre it doesn’t really tell us much. according to this source, a gallon of oil has about 13kWh of power which means that a liter is near to 3kWh of electrical power. That likely assumes a fairly efficient large-scale power plant vs. a small generator set. Which means that there is a reasonable chance that this process is pretty close to energetically neutral. Which is fantastic!! but also an opportunity to improve the process. yes, it looks like 3kWh in gets 3kWh out. let’s keep in mind that plastic waste is a gigantic problem, so converting the garbage into fuel is a great thing. We can likely use renewable energy to power the process. And technology tends to evolve towards higher efficiency. That it is neutral now is a great starting. That violates the 2nd law of thermodynamics. In reality it yields less energy than what was put in. No, because the plastic was already there. If you had to use energy to create the plastic, and then refine it to oil then what you are saying would be true. Energy was already expended to create the plastic, though, so from your personal standpoint when using this machine, it could be a net energy gain. It’s a bit like drilling for oil, right? From a human standpoint, it uses less energy to drill and refine oil than we get from burning the oil, but in reality (due to the 2nd law of thermodynamics) much more energy went into producing that oil – millions of years of growth and decomposition, which ultimately was powered by our big fusion reactor in the sky (and a bit of our own planet’s energy). in addition to the energetic calcs presented below, I’d like to remind us all that waste plastic is a problem. We spend much energy moving plastics, bundling them, burying them, picking them out of the sea, then burying them again (or burning them)… if this process helps provide an end-use for plastic waste, then even if it is energetically negative it is a good thing. We still need liquid fuel, at the moment, we do not need plastic garbage. Very good point, Steve. Even when (I was about to type “if”, but one has to hope) we reduce the heck out of our use of single-use plastic and dramatically up recycle rates, this process is entirely sensible. That violates the second law of thermodynamics. the discussion about violating the 2nd law of thermodynamics is forgetting a fundamental point: energy (in form of fuel) is produced from electric energy PLUS the energy contained in the plastics. Therefore, it is not energetically neutral nor is it violating any thermodynamical law. Assuming following heating values (energy content) for the production factors: between 10 and 12 kWh/kg for PE, PP and PS, around 12kWh/kg for the output fuel (querosine, gasoline and diesel), and a fuel density of 0,7kg/L (recall that 1 LITRE of fuel is produced and not 1kg), and further assuming the original numbers from, the article the energy balance is given by: 11kWh (plastic) + 1kWh (electricty) = 0.7*12kWh (fuel) + losses. Hence, the process has an energy efficiency of about 8.4kWh/(11kWh+1kWh) = 70%. If the electricity input is 3kWh, the efficiency drops to 60%. I think Ito-san was referring to the CO2 that would result were the plastic to have instead been incinerated, which is commonly done in Japan. I would like to know what is left when it’s converted back? I know the waste is greatly reduced but what is it? Hi Selena. As explained in the article: “the small amount of inert char residue that may be leftover can be disposed of with regular garbage.” That says “may” because the amount depends on which type/s of plastic are put into the machine as some convert completely. Remote places in India ? I doubt there are any. The plastic of the future will be made by a process developed by Metabolix Inc. This new plastic can be used for all purposes that oil-based plastic is used for. However, the new plastic is made from plants, and will biodegrade at the appropriate time. Your idea is good, but also very fresh．You let me know oneself．Thank you! This is really fantastic. If present day governments all over the world take note of this and allow their citizens to acquire this gadget and use for their vehicular consumption our world will certainly reduce global warming and save environment and also lots of money by way of not transporting oil from refinery to end user. hmm …is it true that that machine cost only 10 ooo usd? what else you need up to disel or petrol? Like the car that runs on water, no invention is good unless it can be cheaply and quickly mass-produced and delivered to consumers at the grass root level. This invention is great but I must be able to buy it NOW. I’ll help promote it and have bookmarked it as one of my favorites at ‘funnyaccent1’ on Youtube. Where to can I send my check? Well Funny Accent, it’s very nice of you to offer to help promote it. Hopefully you’re not being insincere… Because when it comes to your opinion about it being no good unless it’s cheap & mass-produceable, I must say you’re wrong. Blest is a business and they seem to have plenty of clients (factories and whatnot) that purchase the machine and use it to eliminate the plastic waste they produce. How could that be bad? Yes, the smallest model (priced around US$9000) may be too expensive for individual homes, but a community might easily decide to pool to invest in one. Ditto for the educational uses of this machine (teaching children that plastic is made from oil and all the consequences of wasting it) – how can they be disregarded? To Carol S.: You can easily check my YouTube page to see I’m sincere. I am always ready to embrace new ideas at a time where everyone complains without providing any solutions to the problem.As the invention of gadgets accelerates at an ever faster pace, Blest’s window of opportunity TO MAKE IT BIG is fast diminishing. Eventually higher oil prices will force us to eliminate most plastics production which would solve the problem automatically. If this machine could be sold for under $1,000 it would help the planet now, and the bottom line profit could increase exponentially. Factories and “whatnot” can go broke overnight as we have learned in the US just recently. But people willing to lower their gas/heating or waste bill will continue to look for such a solution IF they find an honest partner. Blest could step up to the plate without appearing greedy…and still make lots of dough. Bless you. Oh, it’s true, you did generously include your YouTube info, didn’t you? Anyway, I don’t think Blest is out to only make it big in the all caps way but hey, maybe I’m naive. And on that note, isn’t it precisely when oil prices force us to stop producing plastic that this type of machine will prove all the more useful? PLEEEEEEEEEEASE, that is as old as my grannys shoes. There were already 20 years ago 2 german young engineers presenting a simple machine/process, returning all platic waste back into crude oil. They ve been in the media some days to make folks happy and then only been heard of to be threatened to be sued there shoes off if they will continue their work. There is nobody in big business interested in this kind of machine, WE THE PEOPLE NEED THAT. So why not publish all plans leading to free energy, recycling and other usefull machines /processes on the web? that s the only way to prevent them from being hidden in a drawer, or do you have any better idea? Agreed- gasoline is EASY to replace compared to plastics. Work has only just begun on finding viable alternatives to petrochemical based materials, but it HAS begun. The best thing we could do to further that effort is to ban the originals as better alternatives become available. How come the grocery store can still give me PET bags when Biobag is out there? How come I STILL receive packages with styrofoam peanuts 20 years after I first had something delivered with the corn starch ones? We no longer allow CFCs in hairspray or lead paint, and I haven’t noticed it degrade my freedom or quality of life. Would this be a perpetual energy machine if one discounts the energy required to generate the plastic waste it needs to do its thing? One Kw of electricity equals how many BTUs ? Then, how many potential BTU’s are in one liter of the oil this machine produces? Pretty soon everyone on the block could have one and then people could begin dropping off the grid and processing their own energy with oil fired boilers that produce steam to turn mini turbines aka generators to produce electricity. Then, unhook from the grid and plug your own little generator into the place where the commercial service formerly plugged in. This would reduce your CO2 footprint, make you famous as a neighborhood trash hound, and one could even enlist the local girl and boy scout troops to pick up all the plastic tossed aside on the highways and byways. Or, is it a scam? I think this is a great idea, the idle pollution control infrastructure, could be employed, maximizing crew and equipment readiness and skills, while cleaning the environment and earning revenue. I’m amazed. It is the greatest invention of all time. I am Biologist and Environmental Educator and I congratulate you. I feel obliged to ask you a question: How do I acquire such a machine? Will you share your invention and cost? I want to discuss the science behind P2O. Monomers are a natural bi-product of crude oil. These monomers are “glued” together to make plastic. That’s about as simple as I can explain the process. The process requires very little energy, and the “glue” holds the pieces together very well.The reverse process, P2O, is inefficient. It requires either a lot of energy (in the form of high temperatures) or expensive catalysts (typically from the platinum metals group). After discussing the technology with a doctor of chemistry (PhD Inorganic Chem) and an assistant professor from the U of Wisc, the determination was made that the technology would lose efficiency when scaled up.Speaking strictly on economics, the idea fails, and pretty badly at that. Envion (a US company in a similar field to Blest) claims to be able to do the process in a low temperature vacuum without a catalyst. This is probably hogwash. They also claim to be able to use unsorted plastic as the feedstock for the reaction. This might be true, but would lead to toxic end product.Basically, the math worked out as follows:Perfect efficiency of the system = 47% return net of energy consumed in the processThis number is based upon data from Envion’s website of 62% yield and applying a “perfect” energy consumption of 25%. (The consensus was that 50% consumption was a more realistic target, which would mean 31% return net of energy consumed in the process. )So, basically, you get 31-47% “oil” for each equivalent ton of plastic waste. This is where the “but it’s waste, so it’s free” argument rears its ugly head. “Free” is a misnomer, as someone has to be paid to sort/clean the plastic. Then someone has to transport the plastic (or the machine, if the case may be).Basically, any “net negative” carbon production is off-set by the energy expended to produce the oil. Then, the oil still gets used for something, so the CO2 that was supposedly removed is put right back into the system upon consumption. The technology is a bit of science and a WHOLE LOT of marketing. The claim of 1L of synthetic oil for 1kg of plastic is gross production, not net. 1L of petroleum equates to 0.88Kg, so 12% is released somewhere as a leach bi-product. This doesn’t account for the $0.10/L “cost” of production. (Here I used the most efficient price, as opposed to the 20c cited elsewhere.) So, if it cost $0.10/L in energy consumption, that would equal to $15.90 per barrel equivalent to produce (16 Oct $70.94 – US DOE world basket price of light sweet crude barrel, for comparison). Of course, this doesn’t account for the fact that the “oil” isn’t refined (as someone else pointed out). So, basically, we get “dirty” oil (low in sulfur, but containing BPA) for $15.90-$31.80 (depending on whose numbers are used) per barrel in 2009 Oct prices. To keep things consistent, this works out to $0.2241-$0.4482 per $1 priced in light sweet crude.That number accounts only for the energy consumed in the process, with assumption of $0 allocated to transportation. In order to off-set the $12,700 price tag of the unit, one would need to produce 16,368 litres of “oil” to break-even. (Again, this doesn’t yield consumable product… just unrefined light-medium crude equivalent.) Assuming you had the 18,600 Kg of plastic to convert, that is. It was never made clear how long it takes to convert the Kg of plastic, but someone mentioned 3 Kw consumed. Based upon 1KwH energy consumption of the machine, that would mean 55,800 hours of use would be needed to break even on cost using the portable device… roughly 193.75 months of continuous use. So, assuming the average individual were willing to devote time to run the machine four times per day (once when just waking up, once on break from work for lunch, once when returning home and once more just before bed), that works out to 96.875 YEARS of using the machine before the net expenses are $0. Of course, the machine will likely break long before that number is ever reached. What happens to the thousands of additives in the different kinds of plastics? Do they end up in the oil ? If yes what happens when they are burned? This idea could be more danger than miracle. I posted earlier that the plasticizers (phthalates) would be present in the oil and when burned would enter into the atmosphere, but that comment (a thorough response to other concerns as well), has yet to be approved. first, Blest technology only manipulates PP, PE, & PS plastics; the system is completely safe and is model as a 5th generation technology; no poisons, nothing. just needs to be cleaned every 300 days to remove sludge build-up from plastic to oil conversion; and, this needs to be disposed of either by land-fill or incineration; you may say this destroys the environment, but if you consider this machine is removing 8 kg of plastic every day from our environment, reducing the cost of gas, and saving the ozone from its eventual decay and decomposition, the pros far outweigh the cons; 8 kg multiplied by 300 days equates to 2,400 kg of plastic changed to 2,400 liters of oil which may either be directly used to run said machine OR be sold to a local refinery at fair market value of US$92 per barrel (petro); so, by using a Blest machine, not only do you save the environment, you are making an indefinite return on investment with a very low (considering there are no competitors to Blest) return on investment ratio. I was hoping you could clarify some of your statements. What do you mean by “5th generation” in this reference? The only times I’ve heard that terminology utilized were for computers (in the 80s) and now with mobile devices. So, I simply don’t understand the reference… it seems irrelevant, to be honest. The other issue is about the accepted plastics. Here we have a mixed quandary, so to speak: PP (type-5), PE (type-2 & type-4) & PS (type-6) plastics are accepted by the machine. This does not require sorting, but not sorting appears to decrease yield/purity of the end product. The key issue is PS. Polystyrene is viewed as tough to recycle and toxic to foods. The thing is, however, we (as a society) have figured out how to recycle PS without creating additional costs. Walmart (which is often viewed as the great evil for many human-interest groups) is doing what they can. There’s a nice video on YouTube (http://www.youtube.com/watch?v=WS-lIrQGC78) about it. I’m still not completely convinced it’s the perfect solution (as older PS still would have CFCs… so they’d need to develop a means of dealing with that), but it’s certainly a solution to the problem of landfills… and I don’t have to pay anyone $12k for it to happen. PE is widely known as a plastic type with a high potential for reuse/recycling. HDPE are accepted by most curbside programmes and LDPE are accepted by most major grocery/supermarket chains. PP isn’t widely accepted just yet, but more facilities are accepting it for recycling. I have no idea what your point is with the above phrase. Is your point that the machine is a poor investment, but one that should be made anyway? I mean, I’m not even certain the assumption that we’re helping the environment is an accurate one. I’ve been told that my view of this is slanted, as I’m not living in a developing country. If we assume that the concept of p2o is geared toward removing plastic waste from the third-world and developing nations, then the machine makes no sense at all. Who is going to pay for it? The machine costs 1/3 of the per capita GDP for Japan… JAPAN! It costs more than the combined per capita GDPs of Thailand and the Philippines. A developed nation and two of the more “developed” nations in terms of economy and education. If Blest were to give the machines away for free (as opposed to just showing them to the countries), then I could see this being a worthwhile endeavor. Honestly, how can you tell countries that live three+ generations in a single structure to invest in this technology when they can burn it for free? Education without solutions isn’t the answer. And a $12k machine that never pays itself off is not a solution. Honestly, even if we were to assume labor and plastic acquisition costs to be zero, this doesn’t make sense. We don’t reduce the cost of gas. We don’t help the ozone layer (instead of being subject to the eventual decay/decomposition, we accelerate the process by converting the plastic into a consumable energy source (at a 50% consumption rate for initial acquisition). This isn’t a simple situation where we can say “the pros far outweigh the cons” since the only “pro” is removing plastic from landfills. Yes, I understand that converting it to oil is better than “just incinerating” the plastic waste. However, it’s neither the case that this particular technology is going to stop the incineration. We need to educate third-world and developing nations (both the governments and the communities) that recycling plastics (and the sorting that goes along with it) are worthwhile. The world’s largest plastic producers need to acknowledge this as a problem. If they’re willing to hurt their margins a little (recycling does cost more than producing new plastic) on their books today, perhaps they could be repaid in carbon credits or something akin for reducing the GLOBAL carbon footprint. Instead of producing new plastics, they could set up recycling collection programmes in hand with the incinerator/landfill owners (governments or private companies) to “buy back” waste plastics with useable (salable) products. Solutions are about coming up with an idea that can be widely implemented on a small scale or implemented thoroughly by a select few groups deemed to be high consumers. The high consumers are the developed world… and a solution that is basically a perpetual loss won’t be accepted. I’ve defined the terminology that you used in your statement based upon what is considered standard by financial professionals, below. Return on Investment: The expected profits received from an activity based upon known or assumed margins and investment requirements. I’m not a scientist. I’m a capitalist, and small business owner in Colorado, U.S.
Can I make money off it? I get that it makes oil. What type of oil is produced? Where and how do you sell it? Let’s assume it makes oil similar to the type that is pumped out of the ground and sold as crude (most likely not). Gas is worth considerably more than oil. This is not gas so is it refined oil? As of 1/6/2010, crude oil is $90 per barrel, which has 42 gallons, or approx 160 liters. The above article says it takes 1 kg to make 1 liter of oil. For those using the English system, that’s approx 320 lbs of plastic to make $90. To make $10,000, you need 322 barrels, 103,040 lbs of plastic, in 240 hours, or 6 8-hour work days, using a lot of wild assumptions. Again, pointing out assumptions are exactly that, finding 103,000 lbs of plastic is no small feat. Without changing society lifestyles, your only going to find this volume at a landfill. Your not going to find this sifting through trashcans, wastecans at the office, or if you do, then you have now added material collection costs. This is still a good idea, defined by for profit, for a large company, or organization. It also has a benefit of replacing the cost of disposal. For a neighborhood, not so much. For a 3rd world country, this example doesn’t really help much. Like scrap metal, this might have a nice side business. Scrappers drive around looking for metal to convert to cash. If a region had one of these, I could easily see a new type of scrappers sifting through our garbage dumpsters looking for “black gold”. Is there a reason that my previous comment hasn’t been approved? I think it’s fair that you present both sides of an issue. Especially when you supposedly represent the UN, which is presented to the masses as an unbiased NGO. We did not approve your comment because we do not know anything about the company and individual you refer to. Moreover, this article does not make any mention of that specific company and hence your comment does not seem relevant, at least not the first paragraph. We welcome your comments on the merits of or problems with this technology. The comment in the first paragraph was in response to the consistent comments by others about how great a company it is. I just didn’t want folks getting sucked into a boiler room pump and dump. Beside that, could you post the REST of the comment with that paragraph edited out? Yes, sure. Will do now. Thank you Brendan. I just rewrote most of it, though. I was a bit more thorough with the calculations this time, and used the raw assumptions of the article and blest.co.jp, so the numbers will look different. Again, this is due to a different set of assumptions (Envion’s + input from an inorganic chemist and a theoretical physicist, versus Blest + article). One thing that I keep forgetting to mention… in order to get energy, we still need to burn the oil (or consume it in some fashion), so claims of net negative CO2 production aren’t exactly honest. In addition to consume the oil that is yielded from the plastic, we would be consuming 25-50% of that in the process. So, in reality, we’d actually be increasing the carbon footprint. I want a technology to save the planet as much as the next person, but until ideas come through the pipe that are economically viable, no one will care. Something else that I noticed… when I posted that the plasticizers would be found in the oil, this was under the assumption that the article was accurate in its entirety. Unfortunately, it wasn’t, as the machine doesn’t process plastic types 2-4 (which would mean 2, 3, 4). Instead, the machine supposedly processes types 2,4,6. Type 3 (PVC) is what would have the phthalates (plasticizers) which would be released during combustion.The following page seems to imply that the time needed per batch is 3 hr, a batch is 0.7-1Kg and 1KwH is the rate of consumption:http://blest.co.jp/seihin-1eng…That means that someone would need to be operating the machine (loading the plastic stock, cleaning the lines, swapping out the end product) every three hours.FoothillsCO wanted to know from a capital exchange standpoint whether it’s a viable product.If we assume that the 20-cent per L (Oct 2009) costs inflated at the same rate of oil (14%), then we’d expect a 28-cent per L cost today for the same production output. At $90/barrel, 1 L of light-sweet crude would cost 56.255-cent. Of course, the end product of the machine is light/medium crude equivalent, but let’s ignore that for now.So, assuming the machine somehow had perfect efficiency and perfect inputs (the best type of plastic for the machine seems to be some variant of PP), we can expect a 28.255-cent “profit” per 1L of production. At this point, we’ve associated no costs to transportation, storage/containment, plastic feedstock (meaning the waste plastic, not the monomer feedstock in the chemical sense), labor (to fill the canister/change out the vials), nor environmental impact of releasing non-carbon chemicals into the oil.Now, assuming our net product is clean (which it probably won’t be, but since we are assuming clean PP, let’s just say it is), we end up with 44,948 Liters (281 42-gallon drums) of production needed to off-set the initial $12,700 investment. Since each machine can optimally produce eight Liters per day (though it would be a better assumption to say four), we need 11,237 “days” of optimized, non-stop production for the machine to “break-even” on fixed costs. That would be 30.786 years during which the machine would be running without break-downs, servicing, or operator error. To be completely honest, I don’t think the machine will last for 30+ years. The Blest processor is more of a novelty than anything.To those who point to the environmental benefit of taking plastic out of landfills as off-setting against the expected economic loss, I’m not sure I can agree. I recall from my environmental economics course (which effectively was studying the impact of oil prices on the consumer) that 8% of petroleum is used by the plastic industry. This is pretty much a naturally occurring process. So, we’ll end up with 8% of every barrel of extracted petroleum resulting in some sort of plastic or something consumed by the plastics industry. Global consumption of petroleum exceeds of 30B barrels per year, while consumption of plastic is 280mm tons per year.Based upon those consumption numbers, we consume 254B Kg of plastic per anum. By contrast, the plastics that enters landfills is about 5% of that.So, assuming 100% of the plastic that enters landfills is renewed into oil, we end up with 12.7B L of oil available for conversion. Assuming 50.23% efficiency in conversion (this assumption based upon net costs of oil from “free” plastics), we would see 637.921mm L (3.987mm barrels) of oil production per year. That would be 10,924 barrels per day. That would be enough to cover North Korea’s oil consumption… assuming someone were willing to absorb the cost of the 1,747,698 machines needed to convert all of the plastic generated every year into oil. (For those counting, that’s $22B.) This wouldn’t even start to address the plastic problem, as this would merely off-set the current consumption rates.There would be no decrease (which invariably implies an increase) in the amount of plastic currently sitting in landfills/oceans/whatnot, and the 10,924 barrels… wouldn’t even put a dent into the production of 72.26mm barrels of oil produced globally per day. How much? 15 THOUSANDTHS of a percent.That would cause the price of oil to go from $90 a barrel to… $89.9865 a barrel.The “solution” doesn’t solve anything. It just creates a marketing opportunity for someone to pray off the goodwill of the masses.The solution is still to reuse/reduce/recycle. There’s no way around it.If we want to save the planet, man has to basically reduce consumption. It’s unfair that the developed world insists that the developing world take the brunt of this by pointing out the pollution that South & West Asian, African, South American and Eastern European currently create. Fair or not, the developed world needs to take the lead in advancement of new technologies.The “green” masses tend to want all problems solved at once, but the reality is it’s simply not possible. We can’t get rid of plastics, avoid nuclear energy and have 100% organic food. It doesn’t work that way. In order to generate enough food to sustain humanity, we need to accept fertilizers. The fertilizer industry is currently looking into isolating a bacteria that will produce fertilizer for free. It’s not organic, but at least it’s not exactly synthesized by machination, either. The petroleum industry is looking at ways to extract gas from shale and pressing other industries to convert to LNG consumption.The only way to get rid of plastics (which would mean less overall consumption of food transportation) and avoid fertilizer and preservatives (which means production yields are lower and food doesn’t last as long) is to reduce the number of consumers. The solution to save the planet is to reduce humanity. No one likes it, but that’s the truth. Wow my math is horrible… 114% of 20c isn’t 28c… it’s 22.8c, so 33.455c per Liter profit. I’m sure everyone can adjust the numbers accordingly. Basically reduce everything by 20% and it’ll be a pretty close estimate. So 25 yrs instead of 30+. Hook up this technology to solar or wind and you get free oil. It’s not free. You lose the opportunity cost of the consumed energy collected by the panels/turbines. I have followed your every entry and learned more in this conversation than I have learned in the last year about anything. I truly appreciate your work here. I don’t understand your comment above, however. Why would we need to consider opportunity costs for the panels/turbines if we are using the panels/turbines to produce energy instead of using energy? Well, I tend to view things in terms of economic value and consumption equivalences. As such, I think in terms of net consumption, rather than situational consumption. If we use panel or turbine collection methods to gather energy from the sun and moon (weather patterns are a result of heating/cooling of the jet stream… which in turn is a result of tidal pulls from the moon and sun), we define that output as G (green energy). The introduction of plastic waste energy requires us to adjust the model to account for plastic waste energy. In this case, we’ll use P to represent the net energy produced from plastic (P = plastic gross energy – energy consumed in the process). We shall represent TS to be our total potential supply for consumption. So, regardless of where e comes from, it ends up being consumed by someone. In a closed system, TC2 would equal TC, so any increase in TS (such as P) would result in a surplus. The problem is that we’re not a closed system. Every year, more consumption is expected. We’re currently using natural gas, solar, turbine (water and wind), geothermal, nuclear, and coal to off-set consumption exceeding petroleum production. If the conversion of plastic to oil is 50% efficient, we are completely reliant upon plastic being a “free” commodity. If we account for opportunity costs, we realize that the efficiency of plastic conversion goes down further (energy and commodity costs associated with production of the mechanism). Given that the break-even on the small scale machine is greater than the probable lifespan of the machine, the fiscal cost of the machine exceeds its economic production. If Blest (or any of the other producers) were willing to produce the machines for free (economic definition, meaning at cost of consumed commodities, energy and labor), then the machine _might_ be viable. It really depends on how large their current profit margin is. To be honest, the machine seems like it should cost $4-$6k, or basically 33-50% of its current price. If that were the case, we would be able to cut the break-even down to 8-13 years instead of 25+. I assume the machine has a viable life-span of 20-25 years, so that might be a reasonable endeavor. After all, if we can net out one watt of energy, then it’s supposedly worthwhile, since we consider plastic a true waste product. However, to be fair, we would need to consider how much energy would be recovered just by burning the plastic, as well. This is where the environmentalists will complain about air toxicity… without realizing that the net oil will get burned anyway, so the toxicity impact doesn’t change. Either the waste product is toxic (which some companies microwave… which means we have particulate toxins… and the waste of energy on running the microwave) or the finished (unrefined) product is toxic. After all, we don’t have the technology to scrub away the toxins yet. Sorry to be long-winded about it. The short answer is, we either have to use oil or solar to power the machine. Since we would have been consuming that oil or solar without the machine, net consumption still increases. The machine isn’t efficient enough to be a viable solution to the plastic problem or peak oil. And, thank you for the positive remark. I really am hoping for someone to post a strong case against what I’m saying. After all, I, like everyone else on the planet, would love free energy. As it stands, I think the solution is improving solar and using nuclear as a bridge until we get there. Sorry for the long delay. I’m in a conference and I needed time to grock your message. I think I got it. THANKS again for your incredible work here and expect a friend request from me on Facebook. Greetings to All: I recently learned about this conversion machine & have done just a bit of reading. Is there any group or agency in the USA that is championing the implementation and use of this process? Apparently, there is a methane byproduct which seems like it could be easily captured and used as well. Any comments as to the above would be appreciated. I wish they’d go back and correct the obvious error in this article – It says that it takes 1 kilowatt to produce a liter of oil. 1 liter of oil contains about 10kwh of energy, so if it takes 1 kilowatt for one hour i.e. 1kwh , that is pretty good – but if it takes 1 kilowatt for a day (24kwh) then its not very good at all. I believe we may be thinking about the same thing, Mitra, except that I’m no chemist nor engineer. The blurb says “[…] it uses a temperature controlling electric heater rather than flame”, to which I, in my ignorance, ask “where does the electricity come from?”. Mitra! Thanks so much for remarking on that glaring error, it is indeed kWh. You also inspired us to seek further clarity: Blest refer to 1 kWh as the “running cost” and their specs on this particular machine say it can take up to three hours, depending on the type of plastic (the type also affects the amount of oil produced – the 1 liter example being CD cases only it seems), for the recycle process. So that suggests energy use of 3 kWh per kg/liter, so according to your statement “1 liter of oil contains about 10 kWh of energy” (your source of which is what, may I ask?) that means expending 3 kWh to get 10 kWh which would mean a net gain of 7 kWh of energy. I hope that makes more sense. Regards. Can you help,I have an endless supply of used bulk 600kg fertiliser bags from the agricultural industry and I’m very interested in this device to make used plastics into diesel.If these bags are shredded,could they be fed into the machine and converted? A monkey can see it´s FAKE! I bet a monkey would wonder what the point of faking such a thing might be. The project is very interesting. It´s a chemical process called distillation. Oil is a modern example of that mixture must pass through several stages of distillation. Every material has a melting point where its molecules are broken down into other, however, we must consider a few things: – what is the subproduct of burning of these plastics and what to do with it? The conversion of 100%, there isn´t in human nature. Some insects can a 100% efficiency in converting energy into light, such as the firefly or glowworm. We get 40 to 60% with a fluorescent lamp, the lamp filament efficiency drops to 80% (only 20% of the energy is transformed into light, the rest is lost into heat) What is the cost of conversion of power in this burning plastic? How much octane oil produced (which the octane? ); important to know to get an idea of the buying power of the diesel produced and its strength in the engine. So Carol – did you get anymore clarity from Blest ? Is it 1kw * 3 hrs = 3kwh or 333 Watts * 3 hours = 1kWh as you are saying Blest says? Either way there is an energy benefit. Dollar benefit will depend on what they pay for electricity – i.e. 1kwh ~ US25c; petrol is about US50c/liter in most places, so its probably a net benefit of 50c for every 3 hours. Dane has done a fuller pay-back calculation above which makes it look like this machine is currently a financial non-starter. (especially in somewhere with a high cost of capital – e.g. most developing countries). I was sitting yesterday with someone responsible for looking at how to get plastics out of an Indian landfill, and would love a way to turn them into oil, but based on the numbers here it doesn’t look like this is even close to being a solution unfortunately. Hi Mitra. Sorry if we can’t help you with the details you need. But the good news is that it looks like there’s now a US distributor who I’m sure would be happy to answer your questions. Check out their blog: http://www.e-n-ergy.blogspot.com/. I’m hoping your dream of a solution is very near. I was very impress by the video. I was hope to get more information and look in to the possibility of being the distributor of this amazing product in Israel. I would love to here from you via email at nhemed@gmail.com or if you could direct me to the company. We are a web magazine that simply reported on this innovation. Please contact the company for information. i would love to contact the company, would you know how i can it? That is a completely unrealistic prospect. Rechargeable cars are not the future they will always be too limited. We should be focussing on plant based oils that would power transport that way the 3rd world countries could lift themselves out of poverty through growth. Hah. Planting crops to feed cars instead of planting crops to feed humans? That seems a little too wasteful. Anyway, the real deal is making rechargeable cars: even though they’re more limited, they’re BETTER. An oil-based powerplant does have more efficiency in turning the oil to energy than a car. recharging electric cars is better than what we have used in the past. it’s not the end, just an improvement. I’m glad to see people paying attention to this technology…we can really this in the States, I give props to Japan for being more on top of this than we are. I do not know if anybody has already been talking about it here, because I do not have time to read all those thousands of comments, but I think it is not wise that this machine has to be in EVERY household! That means somebody has to make millions and millions of those metal thingies. That is waste, too. I think there should be places where we could take our plastic trash. There it will be weighed and we get money for it. If you sort your waste then from different types you get different price. The same thing we have with bottles right now in Estonia. If you can just put your trash away for nothing nobody is truly interested about it …. probably only green-minded people. But if you get some money for it then it would be a inspiration for many. Not from the pure heart, but the thing you do is still good. For your plastic rubbish you could take money or as many litres of petrol it could make. You could put all those litres on your account and then when you need it, just use it in some special petrol station. That’s just my opinion. GO INNOVATIONS!! Sounds to be beneficial in upcoming time for everyone around the world.. I have even heard that we can generate old from rubber.. Is it true? I’m interested to buy this machine, but I need further information. I’m waiting for your reply. Thank you. You need to contact the company Yohan (e-mail address is given at the beginning of the article). We simply reported on the innovation. some hope into the situation. I think most people can’t pay for this, how about introduce it to government because they are richer than us. If all the governments accept this idea, I believe our children can have a better place to live. Interesting technology, if it truly works. Superficial article. Plastic is a very stable complex polymer. In order to take it back to ‘oil’ or at least to the less complex hydrocarbon chains that comprise gasoline, kerosene, etc. would take a fair amount of energy probably in the form of electricity. Having lived in Japan I can tell you the majority of their electricity, just like any other industrialized nation in the world, doesn’t come from ‘renewable’ resources. Odds are, if one can get ahold of all of the facts surrounding this device, the carbon footprint of manufacturing and operating this device are through roof. The cost of running the device probably makes running an electric car, like the GM Volt, on electricity generated solely from solar panels and wind mills look cheap. Your spending about 1 kW of power to recoup around a 8 kW. I doubt the carbon foot print is through the “roof” since in many nations the kg of plastic would have been burned anyways. Now you could debate whether or not its better to just dump or recycle the plastic through normal means. The article stated a cost of $.20 cents for one kilowatt hour per liter of oil from 2 kg of waste plastic. That’s what they said That’s roughly $.80 cents per gallon. Heat is the primary ingredient in any refining process. Solar is a very usable source. Google 5000 suns. Even a kid can do it. After that, storage is the challenge and that can be done using broken (melted) glass. It’s all very low tech and easy to do. This machine is helping to reduce the polution in our world…The oceans will say thank you!!! The world needs more people like that!! i”m from indonesia. near my place, we’re so overwhelmed with plastic,trash,bottle,and can, i want to buy this product to reduce garbage from my environment.. i do care about my environmet, i really want to have this machine. can i credit this machine? this technology would be really great if it can be centralized………. if you are having proper methods to treat organic waste then this method can reduce the plastics too. this can reduce the effect on waste on the environment. this is really an innovative idea…..
i am introducing this technique in my project on SOLID WASTE MANAGEMENT as an effective method to convert plastic waste to wealth………..
thanx for all those who have posted their comments here………..
We as a culture just love innovation. However a simpler solution, especially in Japan is to REDUCE plastic packaging. It takes more oil to create plastics in the first place. Is this so simple that most people don’t want to hear it?! Whatsup? Yeah, Jak, you’re dead on. And it certainly isn’t just Japan. Over here in Canada it’s consume-consume-consume and then people pat themselves on the back for recycling. Reduce & Reuse are the two more important Rs that deserve a lot more attention NOW! Hey Carol, can’t agree more with changing the dynamic of consumption to reduction. I’m Californian currently living in Peru. I’ve come to think of the place as the land of blowing dust and plastic. A place where a bit of wind can put you in the center of a small cyclone of plastic bags and Styrofoam. People in the third world use what they can get cheaply. And they don’t understand the damage being done or the damage they do by throwing something on the ground. They have no concept of the dangers. I see people using plastic bottles to ignite carbon to cook food. The stench causes me to want to hold my breath and yet, poor women stand in the smoke and cook for their children. So the machine is needed. It, if production is reasonable, is a way of changing the plastic dynamic all together. I’m always annoyed when the philosophically correct ignore pragmatic reality and waste my time with what they think should be. I call them Uno’s; utopian-Nazi-ostriches. They won’t fix a dripping sink because the faucet should have been of better design. I’ve learned in the third world, if you want to change someone’s mind, you have to make it worth their while. Any political correctness that stands in the way of feeding a family isn’t correct or popular. That’s just the way it is. I wish I owned a dozen of these machines. Think of the lives they’d lengthen. I know its important to make money off this to further its design, but is it possible to get a more in-depth look at how it works? removing plastic would be a great step in the very right direction in saving wildlife… but morality tells me something like this should be readily available at a good price. How long does it take for the average plastic to decompose? It’s fantastic. I hope to see him in tv more often, so people can learn more, and more. Does someone all ready has this machine in his house and has some experience with it? For exemple did someone teach children how it works? Did someone of you really buy this machine? I am interested to buy it, how did the shiping go? Does somebody has experience with this? Muito bom, excelente iniciativa, ele devia ganhar o prêmio nobel! Como faço para entrar em contato com ele? When you burn the oil that you make out of these converted plastics – wont you be generating emissions that are otherwise locked up into the bags for some hundreds of years? In a hypothetical case of global wide spread usage wouldn’t that push climate change. On the other hand just leaving the bags like that would make them clog drains, kill marine life and end up in food chain because of the ingestion of degraded oceanic debris by marine life. Which of these evils can one choose? An obvious answer will be to reduce consumption and hence production of plastic bags. On the other hand considering the global energy shortage and already piled up plastic waste – converting it into oil might not be a bad idea – provided that it is done at utility levels. That might allow collection and storage of all the carbon emissions – which in my opinion should ideally be transformed into naturally existing forms of carbon like carbonates etc and put in other human material consumption cycles where they could be locked in for some time. But if this were possible it would already have been applied to coal based power plants. I am unaware of such things. Could any one let me know if such a process of conversion of carbon dioxide to carbonates would be viable in terms of energy and money needed. The cost spent on electricity to transform plastic into oil, worth the investment? We leave in Brazil. We need this especial machine. We are a NGO here in Brazil collecting plastic from costal zones and educating communities about sea pollution. Please, we must to have the drawings to built some of this machines to start recicling tons of plastic that our actions release from coastal and bay areas. Please, help us on that. Please, google Instituto ECOFAXINA to see our job here. Many thanks, peace to all! So, has anyone in this comment thread bought this yet? How can we Refine the oil after having produced it so that it can be used in a car? directly? I want to nominate this video for the EduBlog 2012 awards best educational video. 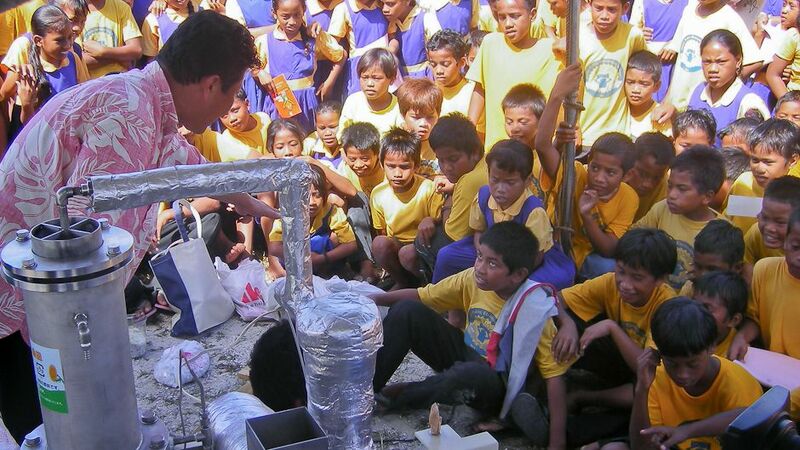 Ito-san has been using this fantastic technology to educate children that plastic is not waste. The story is published in creative commons, it would be more interesting if the machine’s construction plans were published as creative commons. If you keep the knowledge hidden, then you don’t really want the world to change. I want one. Where do I go to buy it!!!! how can we purchase such a device? This is such a great idea ! I’m a student from india and i’m doing my degree in physics. Me and my friends are planning on making this as a project in our college and make this useful in our environment too. With your permission and consent. Can we carry this on in our locality sir? Wow ………. sounds like a great invention. Has any body actually BOUGHT one ? There is an awful lot of questions being asked, and NO ONE has come up with a comment saying ” I BOUGHT ONE AND IT WORKS FANTASTIC ” ……. Would love to buy one if it worked and was cheap enough ……..
what process used in hear??? I need the address of the company. Very interested in getting the machinery needed to convert plastic into oil and it’s by products. can i get one in the USA.is yes where. What about the waste byproducts from this conversion process? What are they and how are they disposed of? Is it possible to do the same with PVC? It appears the last messages here on this article was like 3 years ago. What is the cost today of this type machine. It could really be beneficial to be a reasonable price so that people that need it can use it. lets just say i’m using yamaha xmax 250 motorcycle. if i buy this and use it, can i obtain very good quality fuel oil to use on my motorcycle. would oil quality be as good as bp or shell gas station’s. As as been pointed out, 350º (this according to the video I saw of Itou-san) is a pretty large energy investment needed to liberate oil from plastic–especially in Japan where energy costs are very high and its production is problematic (TEPCO?). Of course, that does not include any refinement of the oil into gasoline, kerosene, etc. It seems to me that you would have to be thoughtful about what energy source you would utilize in liberating energy from plastics. Of course, since Japan represents the environmental antichrist, they do burn garbage and could “recycle” some of that energy to recycle plastics. This would, of course, encourage burning as a solution to waste accumulation and help Japan to continue avoiding the obvious problems of environmental degradation and air pollution (read dioxins). At $12,000, it seems apparent–although impossible to say with certainty having no specific information about the process or COGS–that Mr. Itou and Blest are less interested in the environment and more interested in being Blest with large quantities of money. I say this also because I am very familiar with Japanese culture and its insatiable appetite for money. Finally, it is of interest to consider that Japan is garbage happy, and plastic is one popular choice for garbage production. Each municipality in Japan charges pretty hefty sums as juminzei, or inhabitant’s tax; and part of that represents garbage disposal service. At this point I can only assume that some municipalities are quietly purchasing these systems (if they are, in fact, viable) and using them to generate revenue for garbage which has already been taxed. Additionally, you must purchase officially sanctioned garbage bags (a tax) and in some places even purchase a ticket from city hall in order to have the right to purchase the bag (a second tax). Simply put, they are surreptitiously double, triple, and even quadruple charging the public. Taking these possibilities into consideration, the Blest machine seems much less like garbage salvation and much more like business as usual in Japan and has nothing to do with the environment and everything to do with big business behind closed doors. If they are going to do this, they ought, at least, to have the courage and honor to put this out in the light of day and let the public decide whether it enjoys being abused or not. It would be better for humankind if this technology is owned and managed by organizations who actually care about the environment and not governments or oil and gas companies. I really want to know more about this product and info on how to get one to the US and help market it here. But need to get price down to be more available to everyone. This needs to be spread around the world. Wow, thanks very much, Mr. Noel! In a strange coincidence I was just thinking recently that it was time to check in and see what’s developed in this tech arena since our blockbuster story several years back now. This sort of machine would be fine if it could operate in poor countries in remote areas without electricity to operate it. In defence of plastics I would like to point out that most plastic is made from the +/- 3% waste in the refining of oil, which would otherwise be thrown away, or made into naphalm. In defence of the plastic shopping bag they are just a small aspect of the plastic pollution problem, but the most visible, hence the target of environmentalists. How expensive is that process of burning the oil into gasoline and is it a separate process from this machine? Why does it have to be so damn expensive, shouldn’t they mass produce this so regular People can buy it? 12700USD it too much for me. 1270USD on the other hand, i might be buying. Occidental Petroleum in the 1970s did organics pyrolysis to “Ecofuel” (“garboil” in the labs). It was a fiasco. Making fuel with endothermic processes is hauling water with leaky buckets. “Gee, where did the net outputs go?” Hey there, unsmartful Enviro-whiners, plastic begins as oil. Plug the Enviro-flatus and burn plastic waste as solid fuel, ditto corn versus fermentation ethanol. For every sugar molecule fermented for the latter, two of six carbons are lost as carbon dioxide. Fuel ethanol begins with a 33% loss atop prior losses for growing, transport, and processing corn starch to corn syrup, and for waste disposal. Overall net energy gain is real world 10% overall energy loss. That is why the entire process string, plastic or corn, is not fueled by is own output. Petroleum refineries don’t suckle the grid. Five years later, where is it? It is buried in a thermodynamic graveyard awaiting government subsidy resurrection, Ciali$ for flaccid Enviro-whinerism. Well, Al, if you knew as much about science as you seem to wish people to believe, then you’d know that pyrolysis/thermal degradation, catalytic degradation and gasification have come a long way since the 1970s! And if you followed the news, you might realize that sensible people shouldn’t trust the science that is publicly released by petroleum companies on topics that might harm their business (in case you’ve been snoozing: http://www.marketwatch.com/story/how-big-oil-hijacked-the-climate-change-debate-with-its-lies-2015-10-08). Further, if you bothered to look, you’d see that Blest is indeed manufacturing the industrial-sized version of the machine shown in this video and selling them to customers around the world: http://www.blest.co.jp/about_eng.html#a05. Sorry to rain on your status-quo-defending denialist party! Thanks very much, Alison. Very well put. Dear Al – I don’t understand the science of all this very much in your post or Carol’s reply, but I would think that the point is not quite so much that it is a significant fuel source as much as that this is one way to reduce the toxic burden on the ocean and elsewhere, of plastic that will otherwise linger in the environment for ages, killing animals and slowly poisoning water and soil. We have spent too many decades rapidly producing and discarding monumental quantities of this substance and this could be one solution to at least disappear some portion of it. I don’t care about fuel efficiency, even if it were not efficient enough to provide more fuel than it takes to run the machine, I care about reducing the plastic. Certainly getting humans to slow their consumption of plastic, especially single-use plastic, is a slow and arduous effort, so it seems to me this is needed [also]. Also, I appreciate your points about [in]efficiency, and while I hope the real answer is that Carol is right about the progress made in recent decades, I think your arguement would be so much more effective if it were not riddled with insults to people who care about the health of our ecosystems, aka “enviro-whiners” – if we all set aside insults [in every area of life] we can hear what each other are saying so much better.